We’re dealing with some family stuff. I may go into detail later, but for now, just know that blogging and social media are going to be sparse to nonexistent for the foreseeable future. I’m also going to be worse than usual about responding to most emails and such. 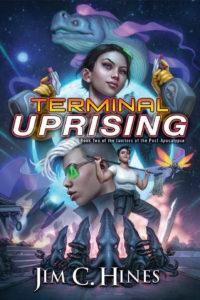 For readers wondering about book three, this does mean Terminal Peace is likely to be a bit delayed. How much is impossible for me to say right now. I know this is … well, a bit ominous, and I’m sorry for making people worry without providing any specifics. This week marks ten years since Amy and I got married. That’s a quarter of our lives we’ve been together. If you look at how long we’ve been friends, we’ve been a part of each other’s lives for more than half the time we’ve been alive. Amy, when you read this — and yeah, I’m gonna make you read my blog again — I know there have been some unexpected … let’s call them challenges. But I love you, and I wouldn’t trade these past ten years for anything. I can’t imagine doing all this without you, and I wouldn’t want to try. I’m looking forward to at least 60 more years. Yeah, that’s right, you’re stuck with me for a good long time. Diabetes Details 11: Doesn’t That Hurt? Because I know other writers read this, and it makes me cranky when stories get the details of my disease wrong. I’m comfortable talking about it, and I think helping people understand this stuff is a good thing. Previous diabetes posts are, shockingly enough, tagged with the diabetes tag. The answer is … yeah, sometimes. It depends. Let’s start with a picture I’ll call Jim’s Collection of Stabby Things. On the left is a typical insulin syringe. I keep some around just in case I ever have trouble with the pump. In the middle is a spring-loaded tool designed to insert the catheter for my insulin pump. That white thing on the end is an adhesive sticker and a metal needle threaded through a teflon (I think) catheter. The spring jabs it into my belly, I pull out the metal needle, and the sticker holds the catheter in place for 2-3 days at a time, allowing the pump to deliver insulin. On the right is the finger-stabber I use to draw a small drop of blood from my fingertips to test my glucose levels. I’d describe it as essentially painless. I test my blood without thinking, and I can’t remember the last time I noticed any pain. Which is odd, considering that this was the hardest thing for me to do that first time back in 1998. I remember holding that thing for several minutes, sweating as I tried to make myself press the button. These days, I don’t even think about it. The ones they use for finger checks in the hospital, on the other hand, are the real-world equivalent of a gom jabbar from Dune. They’re one-size-fits-all, designed to pierce cave troll skin. Thankfully, mine’s adjustable, meaning the needle goes just deep enough to draw blood. Diabetes syringes weren’t usually painful either. The needles are very thin. Every once in a while I’d hit a nerve or a blood vessel, which stung like hell, but that was the exception. Getting the pump catheter into place … yeah, that hurts sometimes. It’s a slightly longer needle, and the spring shoots it in quickly to prevent the teflon catheter from kinking. I’d say about half the time it goes in with little-to-no pain, maybe 30-40% of the time it stings, and 10-20% of the time I shut the door so the kids don’t hear me swearing. Beyond that, it’s been a fairly painless disease so far. Every once in a while someone at karate will forget and punch me in the insulin pump site, which isn’t fun, but it’s not crippling pain. More like getting whacked on a cut or bruise. And there are potential complications that could change things for me eventually — nerve damage being a big and nasty one. But considering this disease would kill me in days if I stopped treatment, I think the occasional painful jab to the belly is more than worth it. I should point out that my experiences aren’t universal. Some people find the fingersticks very painful. (There are meters now that will let you test a blood sample from the forearm, which has fewer nerve endings to irritate.) I have a harder time with the pump than some people. I had to try several different styles before finding one that worked, for the most part, with my body. So take this as Jim’s Diabetes Experience, not The One True Path of Diabetes Pain. Questions are welcome, as always. Two weeks ago, I took time off of the day job so I could be with my wife during a surgical procedure and the first part of her recovery. Everything went smoothly, and I brought her home on day two. For the next week and a half, I played stay-at-home Dad. I got up with the kids, fed them breakfast, and got them off to school. I took care of dishes, meals, laundry, lawn-mowing, pets, shopping, and so on. I refereed bedtime and got the kids tucked in. Yesterday was my first day back at the “real” job. It only took a few hours for me to hate it. Before I go any further, let me emphasize that I’m grateful to have a decent job, a steady paycheck, and benefits (despite ongoing erosion of the latter two). Given the economy in Michigan and the various health issues my family shares, I know how fortunate I am to be able to support us. But for the past week and a half, in addition to all the housework, I was able to write for 2-4 hours every day. I added 20,000 words to the current draft of Libriomancer, more than double what I would have normally been able to do. I slept in until 7:00 every morning. I had time to use the exercise bike more than once a week. I want that life. I want to be able to write in the mornings, and to jump up when the iPhone buzzes to let me know it’s time to walk down and meet my son at the bus stop. It was nonstop busy, but it was a busy that I loved. If last week were my normal routine, I could pretty much write two books a year. Assuming a proportional increase in my writing income, we could probably live on that … if not for the lack of health benefits. I’ve ranted about this before, I know. It’s the health benefits that trap me. My diabetes is the least of it. My daughter is the only truly healthy one in the family. Thankfully, my son’s asthma is under better control these days. But we need a full-time wage-earner with benefits, and unless something huge changes, that’s me for the foreseeable future. I’m okay with that. I would love to work one job instead of two, but I’ve accepted that this ain’t gonna happen. For the most part, I love my life, and I know how fortunate I am. But these past two weeks have been a taste of what could have been, and while I’ve enjoyed it immensely, it feels almost cruel to have to go back to the old routine. I’ll get over it. I’ve done writing + day job for more than a decade now. I don’t regret the choices I’ve made, and I’m not asking for advice or sympathy. But I decided to give myself permission to wallow for one day. To envy all of my friends who have gone full-time as freelancers, either because they don’t have the ongoing health costs or because they have a spouse who is able to cover that. To mourn the lost time with my family, as well as the books and stories I could have written. And now that the wallowing is over, I’ve got work to do. I hope this post wasn’t too much of a downer, but just in case, have a picture of Flit hanging out in the desk. Thanks for all of the good wishes on my wife’s surgery yesterday. The surgery went great — in some ways, better than expected — and we’re hopeful it will take care of this particular underlying pain. If all goes well, I should be bringing her home later today. I was able to get a First Book Friday post prepped for tomorrow, and I started writing a new rant this morning, so regular blogging service should resume soon. Later this morning I’ll be taking my wife in for surgery. It’s not an emergency, and should be fairly straightforward, but she’ll be at the hospital for a night or two. So my online presence may be a bit spotty. Introduced my daughter to Scorched Earth, then spent some quality time blowing each other up. Watched Doctor Who with my wife on New Year’s Eve, and went to bed ten minutes before midnight. Saw my parents, my in-laws, my brother and his wife … pretty much every family member in the state. Trounced three young children at Mario Kart. Unpacked and assembled my son’s trampoline, then ran around using the foam packing material for swordfighting with the children. Assembled my daughter’s art easel, which turned out to be missing One. Single. Screw. Work on the short story that’s due March 1, or the book that’s due at the end of the year. Write or plan any new blog posts. Write up reviews for any of the books I’ve read recently. It’s not something I can do long-term. Those deadlines aren’t going away, and there’s always going to be too much work to do. But it’s been a very good two weeks. I’ve updated the Reporting Sexual Harassment in SF/F page with a link to the Geek Feminism Wiki’s Sample Convention Anti-Harassment Policy. I particularly appreciate the internal guidelines for convention staff. Months ago, when I was talking about how my e-book sales were about 3-5% of my print sales, a champion of self-publishing said my problem was that my $6.99 e-books were too expensive, and if I dropped the price to $2.99, I’d have better sales. So in mid-October, I put my mainstream novel Goldfish Dreams [B&N | Amazon] up for sale as a $2.99, DRM-free e-book. I posted my first week’s results, and said I’d follow up in a month or so. Well, over the past weekend I came across a post that mentioned the “great success” authors like Jim Hines and others have had putting their own work out through Amazon, which told me it was definitely time for a follow-up. I’ve got about six weeks worth of data now. Are you ready to see what my great success looks like? B&N doesn’t give a nice week-by-week breakdown, but here are my weekly Amazon Kindle sales. All total, I’ve sold 21 copies through Amazon. Add in the 4 copies sold through Barnes & Noble, and I’ve made about $70, selling an average of about 4 copies a week. I should note that I’ve done nothing to promote this particular book. I’ve been busy attending cons, working on short stories, revising Snow Queen, and also doing the day job and taking care of the family as my wife recovers from knee surgery. But it’s pretty clear to me that simply putting a book out there isn’t enough. I know there are people making self-pubbed e-books work for them. My friend Sherwood Smith has been successfully selling some books this way. I suspect that if I released one of my fantasy titles, either a reprint or an original goblin/princess book, I’d do a lot better. But Goldfish Dreams is a mainstream title, so doesn’t necessarily tap into my preexisting audience. I also know that an ongoing, persistent sales effort can drive sales. I have friends who keep up a pretty constant sales push to sell their e-books, and it does seem to help them sell more books. But I barely have time to keep up with the blog. I’d rather keep writing new books and the occasional short story, and let my publisher do most of the work to actually get my books into the hands of readers. I’ll keep checking in with further data, but my conclusions so far? Simply putting an e-book out there ain’t going to accomplish much. Having a preexisting audience helps, but may not do much for cross-genre e-books. Brand new authors with no audience — you’ve got a steep climb ahead of you. Thoughts and comments are welcome, as always! Thanksgiving in the U.S. bugs me. I love the idea of taking time to recognize and appreciate the things we have, but the holiday has some troubling history and associations. I winced when Jackson came home from Kindergarten wearing a paper bag “Indian vest” and headband. Of course, he’s also convinced the Pilgrims’ feast included Crescent Rolls, because that’s what we had with our meal. We’ll work with him and his sister on their history. This has been a rough month. My wife had her seventh knee surgery on Friday, so I’ve been going non-stop as caretaker and mostly-single parent for about a week now. Work has been rather hellish; I’m sometimes taking more than 100 e-mails and phone calls a day. The writing … well, it’s been a lot harder to make the time I need to get everything done (which is why I’m falling behind yet again on blog comments and e-mail and such). Add in two conventions in three weeks, along with several other signings and appearances, and I’ve been burnt out pretty good. This is where I really appreciate the reminder to step back and recognize the good. It’s too easy to get caught up in the stress and the frustration. I’ve got a wonderful family, even if the kids have been a little overtired and cranky today. I’ve got a steady job, one which lets me support my family (not to mention providing benefits to pay for those seven knee surgeries). As for the writing, it is stressful … but it’s also the best job in the world. I may not be able to make a living at it (not in this country, at any rate), but I’ve been remarkably successful, and I love it. So yes, I’ve got an awful lot to be grateful for, and I am. Despite the stress of the past weeks, life is pretty darn good. And of course, on top of everything else I’ve got going, I have a wonderful online community of friends, colleagues, random passers-by, and fans. Especially fans who do wonderful art like this. Thanks, Richi! And thanks to everyone who’s read and enjoyed the books and stories. Heck, thanks to those who didn’t enjoy them, too — I appreciate you giving them a try. Happy turkey day to those celebrating. And to everyone else, have a happy Thursday!